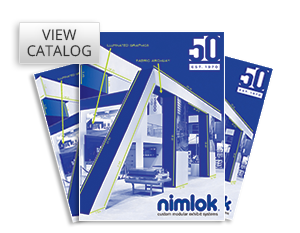 Formulate® Fusion Kit 10 combines a variety of off-the-shelf Formulate fabric structures to create a dynamic and charming exhibit! 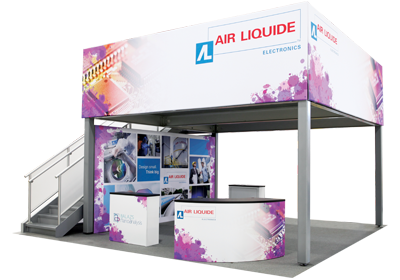 Hanging above is a rounded-corner 16' square hanging structure, designed to proclaim your brand and help visitors find you in a crowded exhibit hall. Four 10' tall, 5' wide towers anchor each corner and are intended to help draw traffic inside the booth and engage passersby with multimedia messaging. 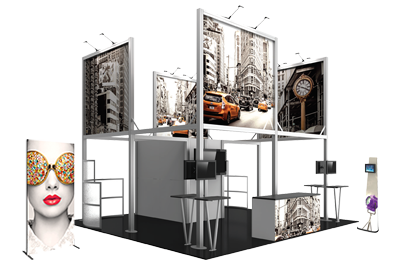 Each tubular fabric tower features two 40"-50" medium monitors to display digital media. A chip-shaped fabric wall sits near the center of the floor space, providing a semi-private meeting space that fits a small bistro-style table and three chairs or stools. A freestanding pillar-shaped fabric counter serves as an area for conversation and reception.